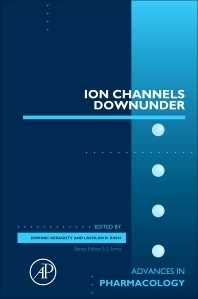 Ion Channels Down Under, Volume 79 provides up-to-date information on ion channel pharmacology, their pharmacological modulators, and their role in a diverse range of poorly treated medical conditions. This new volume covers specific topics relating to Receptors and the Diversity in their Structure and Pharmacology, Acid-Sensing Ion Channel Pharmacology, Past, Present and Future, Sodium Channels and Venom Peptide Pharmacology, the Role of Non-Neuronal TRPV4 Signaling in Inflammatory Processes, and Genetically Encoded Calcium Indicators as Probes to Assess the Role of Calcium Channels in Disease and for High-Throughput Drug Discovery. Contributors in this series include prominent scientists and highly-recognized experts with major accomplishments in the field of ion channel pharmacology. Topics covered include the role of ion channels in health and disease, ion channels as therapeutic targets and the molecular pharmacology of ion channels. Professor Dom Geraghty graduated with a BSc Honours degree in Pharmacology from the National University of Ireland, University College, Dublin, in 1981, and completed his PhD at Deakin University, Victoria, in 1988. Dominic is president of the Australasian Society of Clinical and Experimental Pharmacologists and Toxicologists (ASCEPT) the premier society for the study of medicines and chemicals in our Asia-Pacific region. His primary research interest is the role of TRPV1 channels in health and disease, particularly immune cell and platelet function. He has been at the University of Tasmania for over 25 years where he is currently the Deputy Chair of Academic Senate. Dr Lachlan Rash is a senior lecturer in pharmacology and ion channel researcher at the School of Biomedical Sciences, The University of Queensland. After receiving his PhD in Pharmacology at Monash University (Victoria, Australia) studying the pharmacology of Australian spider venoms, he trained in the molecular pharmacology of acid-sensing ion channels and voltage-gated sodium channels in the group of Michel Lazdunski (IMPC-CNRS) in France. His primary research interest is the discovery, characterization, mechanism of action and structure-activity relationships of novel ion channel ligands from animal venoms. This fundamental work underpins projects to develop selective acid-sensing ion channel and voltage-gated sodium channel research tools and potential therapeutic leads in the areas of pain, inflammation and neurodegeneration.